The neeed for a lifting platform for people or a mixed industrial lifting platfom, which combine people and loads, is evident in many places, both in industry and at home. 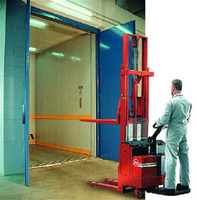 In Vinca we have lifting equipments of these features, which allow that, in addition to loads, passenger can be lifted. Our specialists offer customized solutions for every type of situation, depending on the capacity that must have the passengers lift, the available space, the maximum load that will lift, the frequency of use, the workd and environmental characteristics, and number of people that will use it. All our passengers lifts fulfill the necessary safety measures so that the elevation and movement of the loads as of the people is totally safe, both in industry and at home.